Texas is a state where vests are pretty standard throughout the fall/winter seasons, mostly because of the warmer climate. A vest is the perfect piece for when you want to wear fall clothes but it’s still too warm to wear an actual sweater or heavier jacket! I’ve got vests of all styles and fabrics (mostly items on the dressier side), but one I was lacking is a classic black quilted vest for more casual occasions. I plan to throw this under $100 sale find over flannel button-downs, lightweight sweaters and other long-sleeve tops to wear with jeans and leggings this coming season. 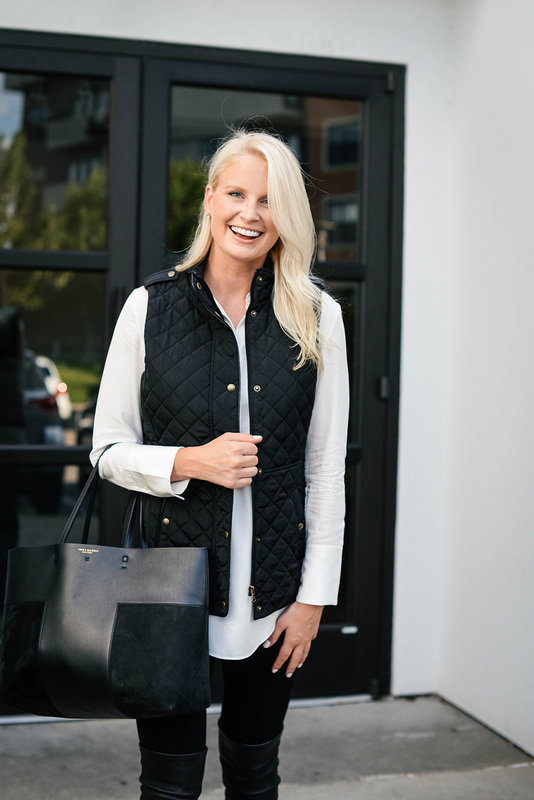 This vest comes in three different colors, is lightweight and not the least bit bulky, which makes it a great option for wearing underneath coats and other jackets on cooler days. The faux leather trim adds a luxe touch too, don’t you think? This Barbour vest is another one I had my eye on, especially in that gorgeous blue/grey color! A fur vest for under $200? It does exist! There’s also this style if you’re willing to spend a little bit more. This quilted down puffer vest would be a great layering piece for cooler climates. Love the olive green color! The genuine shearling trim is a glamorous addition to this grey Lafayette 148 vest. This North Face vest is on sale for under $70 and would be nice to have on chilly morning walks or runs! PS – I know these leggings are pretty much sold out in regular sizes (they still have lots of petite sizes left! ), but there are still a few days for them to come back in stock! They are high-waisted, tight to the ankle and suuuuper stretchy + comfortable. Such a great legging for tucking into boots this fall! Keep an eye on it – you have until Sunday at midnight before the prices go back up! 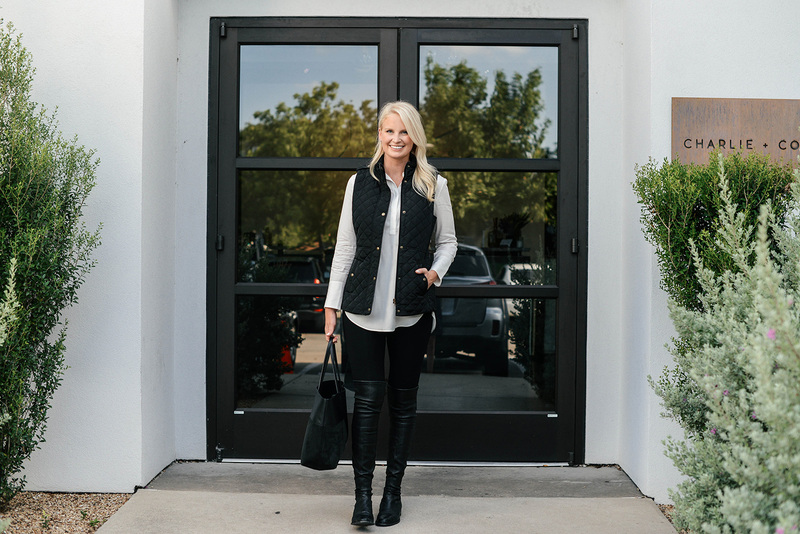 This vest is perfect for Fall, great find! Such a classic piece and perfectly styled. Makes me so ready for fall! 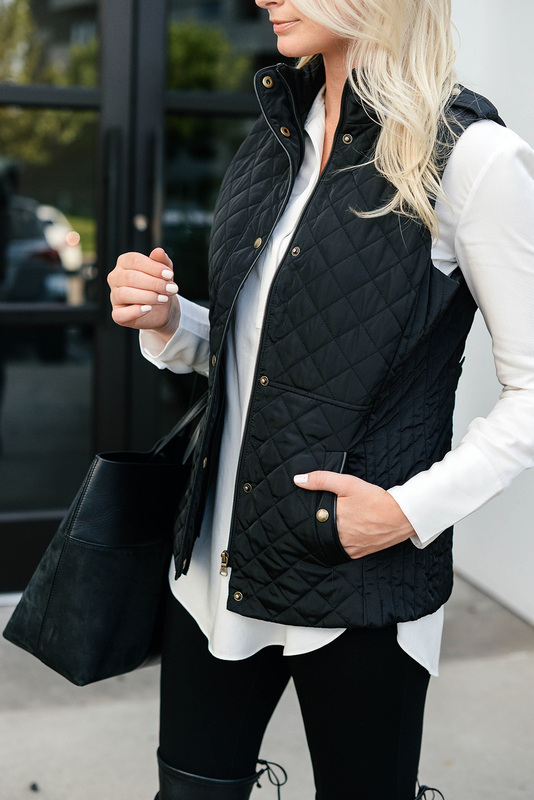 That quilted vest is so classic! Definitely perfect for Fall! 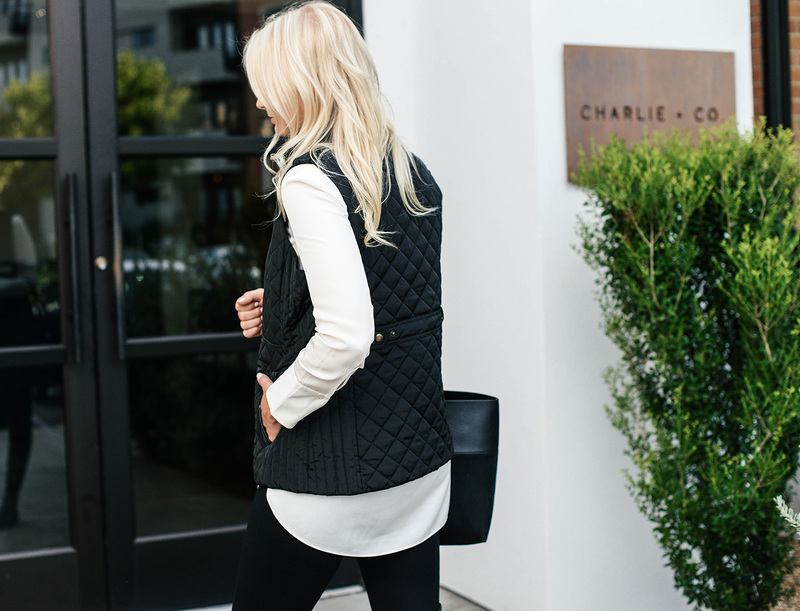 I love how chic and simple this vest is! You can pair it with everything!